Australian author S.J. 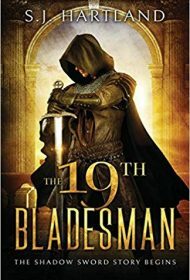 Hartland’s debut novel—and first installment of her Shadow Sword saga—is nothing short of an epic fantasy masterwork. Set in a sprawling, magic-saturated realm inhabited by humans, immortals, and a variety of supernatural monstrosities, Hartland’s narrative is impressively grand-scale. Although it features an ensemble cast of adeptly developed central characters, a richly described world with an intriguing history and mythology, and an intricately plotted storyline, this shelf-bending novel (600+ pages) reads like a much shorter work. Kaell is the mythic Nineteenth Bonded Warrior—a swordsman with god-like fighting abilities whose violent but glorious existence is fated to be spent killing ghouls in order to protect the kingdom from invasion. But when Archanin, the nightmarish god of the ghouls, blackmails a prince from a nearby kingdom to poison Kaell, his near-death sets off a series of events that brings the already troubled realm to the edge of all-out war. While political machinations, deception, betrayal, and seduction, power the voluminous and plot twist-laden storyline, the potentially cumbersome narrative works well in large part because of two elements: Hartland shifts the character point of view frequently, which keeps the momentum consistently high and the action fast and furious; and she excels at creating unique, multi-layered, and emotionally connective characters. Kaell’s ward, Lord Vraymorg, is a perfect example: a mysterious bladesman living in a remote mountain range, he is revealed to be so much more than he seems. Other characters—such as Azenor, a beautiful young princess betrothed to the king; Aingear, a mysterious high priestess; and Heath and Judith Damadar, brother and sister spies from the Icelands—will surprise readers with bombshell revelations that reveal their true motivations. Australia has produced some phenomenal fantasy writers in recent decades: Sara Douglass, Cecilia Dart-Thornton, Kate Forsyth, and Trudi Canavan, among others. Fantasy fans can now add Hartland to that list. Her story is just that good.